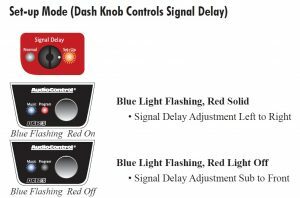 The DQ-61 and DQDX dash remote LEDs have a number of different configurations depending upon what mode the knob and the unit itself is in. When the unit is in “Setup Mode” the lights will have different behavior. You would only put the processor in to “setup mode” when you are setting up the Signal Delay feature. 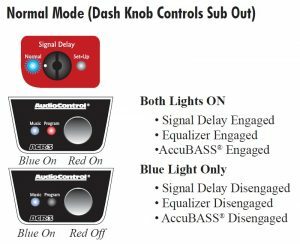 To switch between delay control from the sub channel and the front channels, you would push the knob itself to toggle between the two.